The term ‘redundant’ is used with roping systems however I often wonder how much thought is truly put into this concept. By definition, a redundant component of a system is one that is not needed. A system with complete redundancy is one that will not fail as a consequence of the failure of any single component. 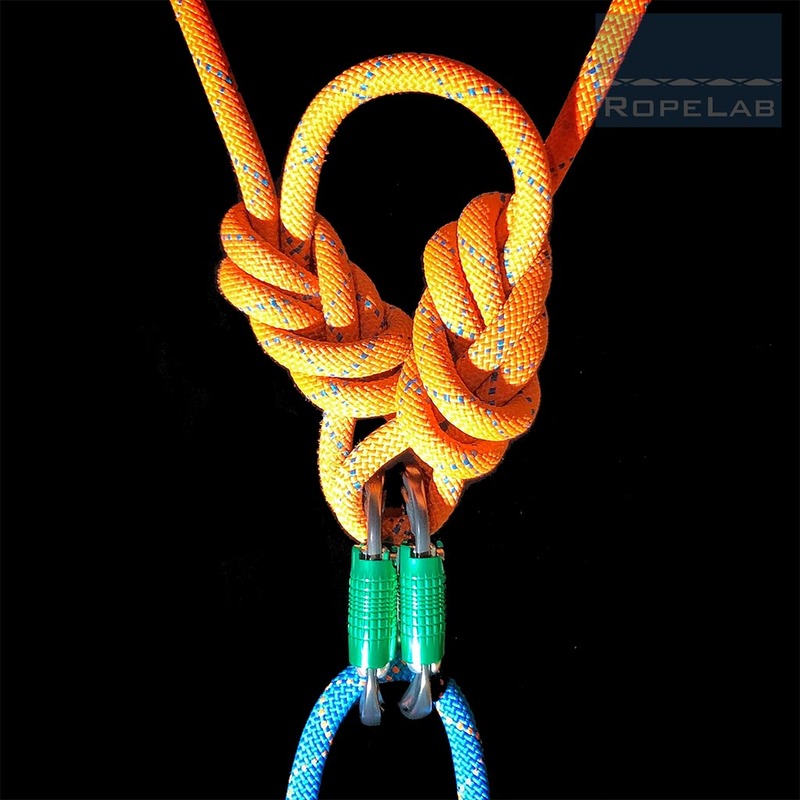 Generally my aim is to have rope systems with no single point or person of failure. My position is a step away from the often-mentioned “whistle stop test”. The theory is that such systems should be able to tolerate all hands letting go on a whistle blast. I prefer to work with the assumption that the action (or inaction) of any single person will not be catastrophic. I also think it is reasonable to have exceptions to “no single point or person of failure” so long as there has been a thorough assessment of the system and potential modes of failure. A risk based approach to introducing redundancy to some, but not all, components of the system. The following video is an example of a minimalist counter-balance rescue with absolutely no redundancy. I used this method in an assessment as a rock-climbing instructor a long time ago. The assessor queried me with: “But you’re still up there?”. Well, the task was to get the suspended climber down an overhanging pitch in the fastest time. My non-locked off descent device. 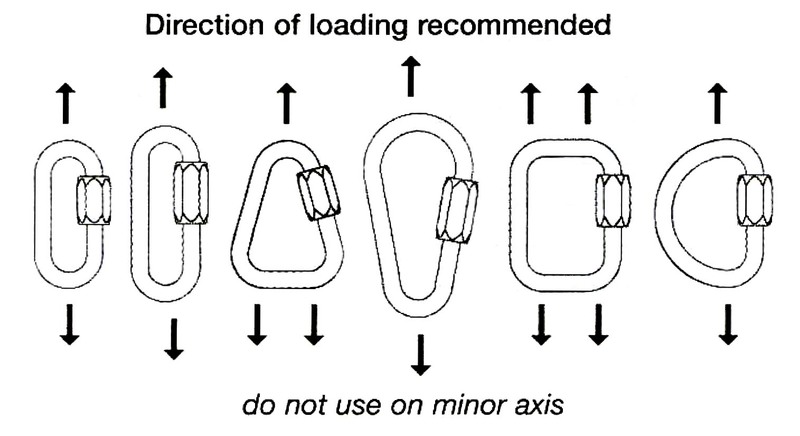 The re-threaded Figure-of-8 knot tied incorrectly. The Italian/Munter Hitch tied incorrectly. My brake hand coming off the brake strand during lower. In other words, pretty much everything in that demonstration was a single point, or person, of failure. There are no backups. Everything has to be done correctly. Just like when rock-climbers belay and lower each other all over the world, every day of the year. Sometimes it’s good to remind ourselves that many people still use rope systems perfectly well with absolutely no redundancy. If asked, many rope access and rescue technicians will claim their systems have complete redundancy. 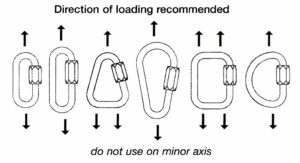 On clarification they will, of course, acknowledge that this generally only applies to the components between the anchor and the harness. 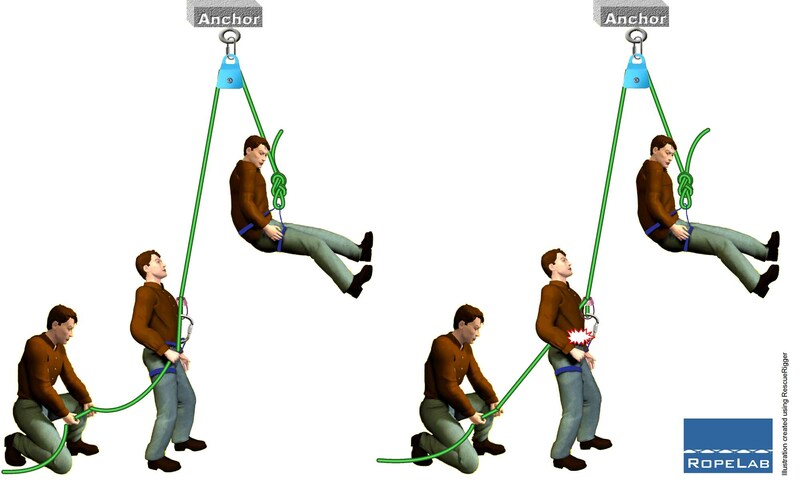 A ‘bombproof’ anchor is unquestionably sound and no-one wears two harnesses. The most commonly overlooked single point of failure is the human operator. Although there are now many devices that attempt to minimise the likelihood of human misuse or interference, there are always those who manage to override these extra ‘safety’ features. It is only when we start to look a little deeper that we can find inconsistencies with this assumed position of complete redundancy. One obvious example might be a Maillon Rapide. If using these in our systems we would avoid having the whole system reliant on a single Maillon Rapide. Not because we question its strength – but because of the potential for inadvertent misuse. So why then, on many harnesses, are we happy to rely on a single Maillon Rapide to connect the chest harness to the sit harness when suspending an operator solely from their sternal (chest) attachment point? And what about rigging plates? Rigging plates used in configurations such as the one shown here have often been the subject of debate. I know that there are many positions on this however I’m going to give mine. Rigging plates from reputable manufacturers are carefully designed pieces of hardware that are manufactured from specific materials that are sourced from trusted suppliers and subjected to stringent quality control programs. I know of no account of a rigging plate ever having failed. I am generally happy to use a single rigging plate (from a reputable manufacturer) in my otherwise redundant systems. 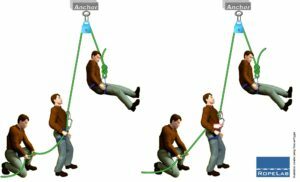 Given our general acceptance of bombproof anchors, the desire to wear a single harness, and that training can provide competent technicians, perhaps we can move forward from the desire for complete redundancy. Our approach to redundancy should actually be risk driven and consider the likelihood and consequence of particular hazards. A carabiner is not closed properly and has its gate pushed open. A knot is tied incorrectly and either loosens or releases. A rope passes over an unprotected edge and is damaged or cut. 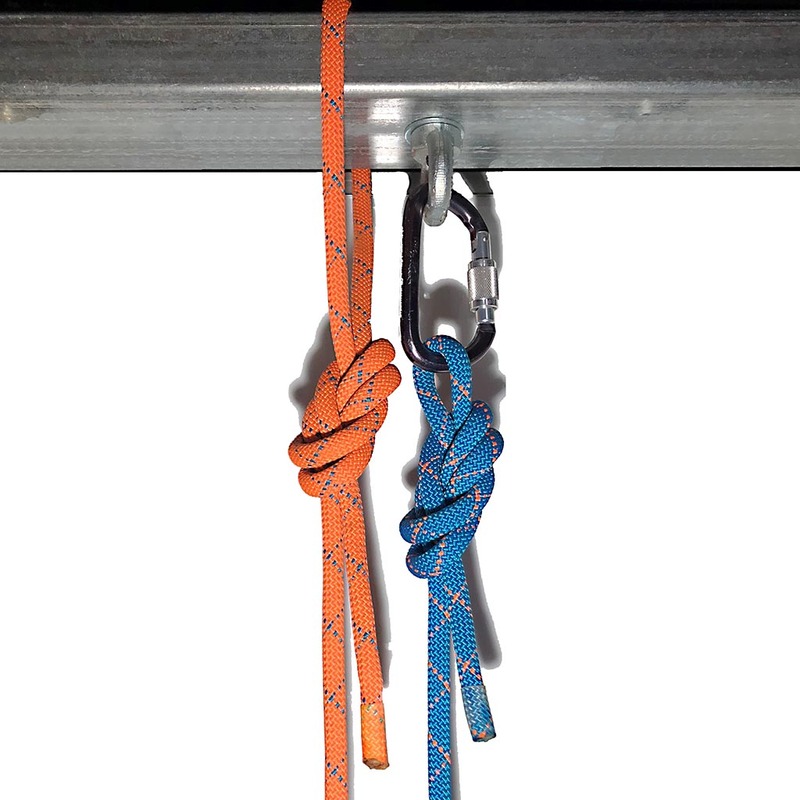 A device (descender, backup device, or other) is threaded incorrectly and fails to secure a rope. An operator overrides the function of a device (descender, backup device, or other). Inadequate inspection before, during and after use. Failure to read, understand, and follow manufacturers’ instructions. Insufficient training and ongoing maintenance of skills. Unfortunately the common factor here is the technician, not the equipment. So, we should make every reasonable effort to ensure that any single human error does not result in catastrophic failure. This means attempting to provide ‘redundant’ components for any aspect of the system that may be misused by a human. We should also be aware that introducing extra equipment may complicate the system and make system checks more difficult. The following image is just an example. 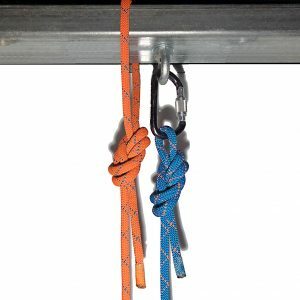 Assuming the structure is sound (and smooth), the orange rope/knot setup is less prone to human error and far easier to understand and inspect than the blue rope/knot/carabiner/ring/bolt. This image is an example of an effort to introduce redundancy. 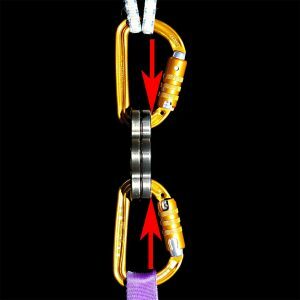 A 22kN sling has been clipped through each carabiner in an attempt to provide a redundant link in the event the 36kN rigging plate fails. Just think about that… if the 36kN rigging plate was to “fail” then that slack 22kN sling, assuming it is not damaged by the flying pieces of aluminium, is certainly not going to hold. The only practical way to provide redundancy to a rigging plate is… with an identical rigging plate. However, we must be certain that stacking rigging plates has not introduced unintended consequences. The strength of carabiners is discussed in detail here: Carabiner Specifications. Importantly, the strength of a carabiner is determined in tests when pulled between 12mm round pins. In this image, the two stacked rigging plates resemble some thing more like an 18mm square pin. 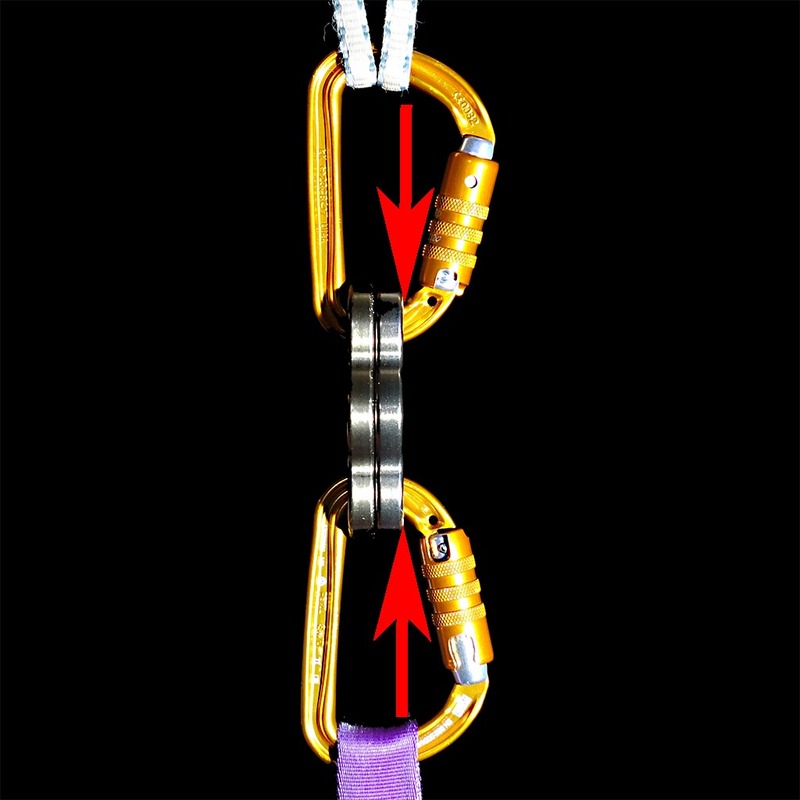 If the carabiner was an offset D shape, rather than the oval shown, then it is conceivable that the load point could actually be 18mm away from the inside of the carabiner spine. So here, adding redundancy to the rigging plate has actually reduced the strength of the system. There are certainly rigging plates that are designed to be bolted together however it may be more productive to revisit the motivation introducing redundancy before launching out and buying more. 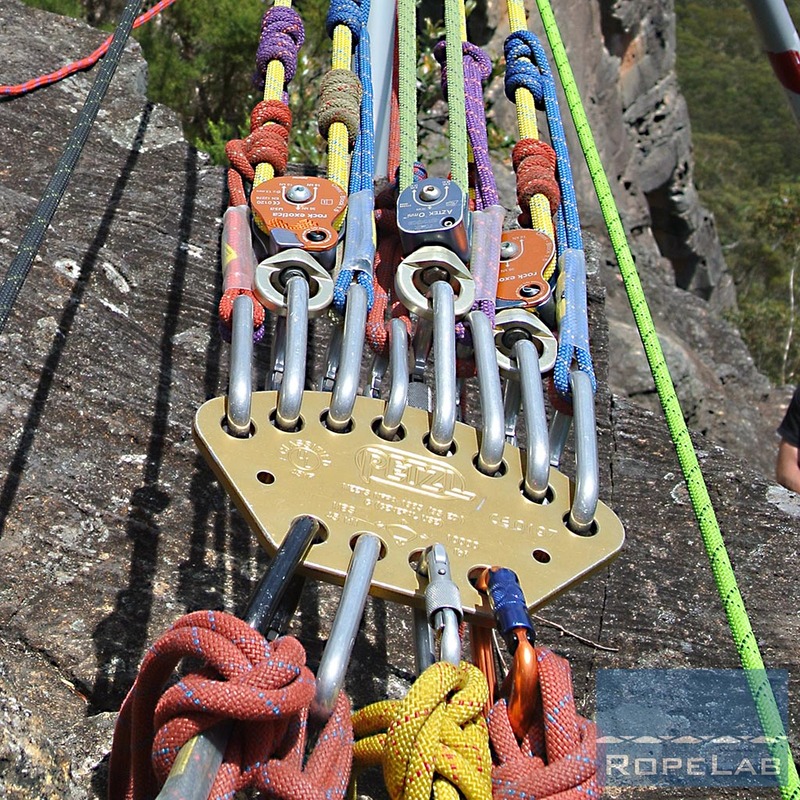 This next image demonstrates the use of a backup belayer to remove the single person of failure operating the non-locking (or locking) belay device. 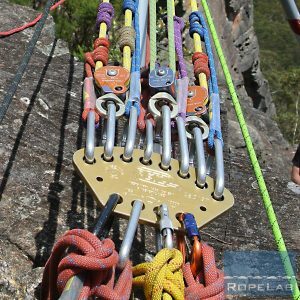 A system like this is commonly used by climbing instructors and in climbing gyms. It will not pass the “whistle stop test” however the extra person (the backup belayer) provides a simple and very effective way to cover poor belaying. Top-rope rock-climbs in a natural cliff environment provide another excellent discussion point for appropriate redundancy. It is common to place two locking carabiners at the top of the climb. 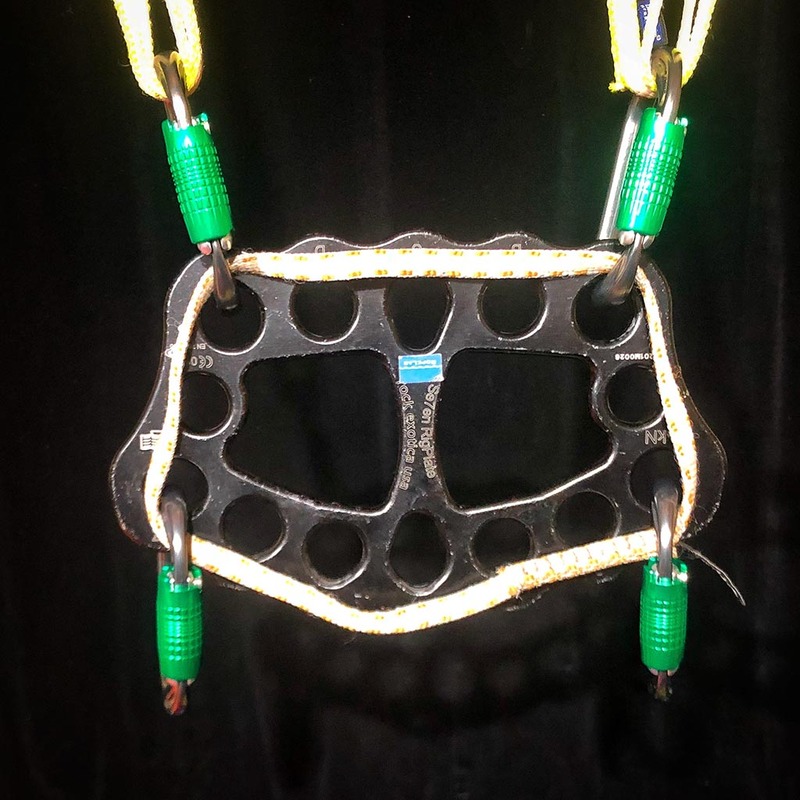 This is appropriate because it is reasonably foreseeable that there could be movement of these carabiners, miss-orientation, or even contact with a rocky protrusion. 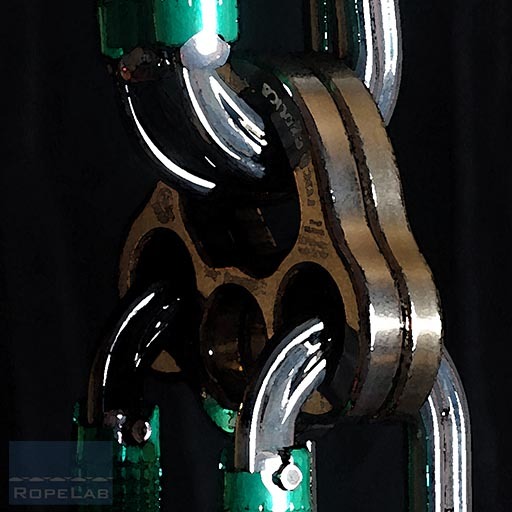 So, even though there is a chance that the double carabiners may actually be weaker than a single, it is more important to guard against inadvertent opening and release of the single climbing rope. Appropriate redundancy should be risk based and protect from reasonably foreseeable modes of failure. This is primarily to cover for human error and misuse of equipment. Sometimes there may be particular techniques or components that need no added redundancy. This consideration must be made on a case-by-case basis and consider the complete context. What was OK on site A may be completely different on site B. Rain or dropping the temperature may change everything. Introducing redundancy should be seen as just one of many possible options for managing risk but it is not THE solution and it will not reduce the risk to zero. I’ve been thinking about the term redundancy and wondering if there is a better word. I get the concept, and that it’s part of the jargon, but we are saying these components of a system are “not needed”. I love the thoughtful analysis of core concepts you do Richard, it always brings new dimensions and clarity to my own practice. Great, I hope this is the first phase of a broader reasoning that supports a greater qualification of technicians and stops the certification drift. I was wondering why rigging plates do not have an EN Standard? Any ideas especially now TMC, s and operators have to use two now for rescue and training. And i have no idea where the sudden change of heart came from? It is possible to obtain a CE mark for components without nominating an EN standard. There are many compentents of our rope systems that fall into this category. It generally comes down to products that were in the market before a relevant EN existed or new products that have a valid use but fall outside a relevant EN. I’m sorry, but I am not familiar with the term TMC. However I see no justification for requiring 2 rigging plates. IRATA was asked to clarify their code of practice by its members and they announced that IRATA technicians would fail assessments if they have a single rigging plate in their system during an assessment. I understand this was purely an issue of language clarification and consistency rather than an engineering analysis. There is no reason to apply this ‘rule’ to any operation other than those that are ‘goverened’ by the IRATA ICOP.